If you see a kid in a game, chances are it's one of the few things that is magically immortal—and the reason why is probably obvious. Child murder in games controversial...but that doesn't mean all developers consider it off-limits. Granted, in this case, we're not just talking about any children—we're talking about zombie children. 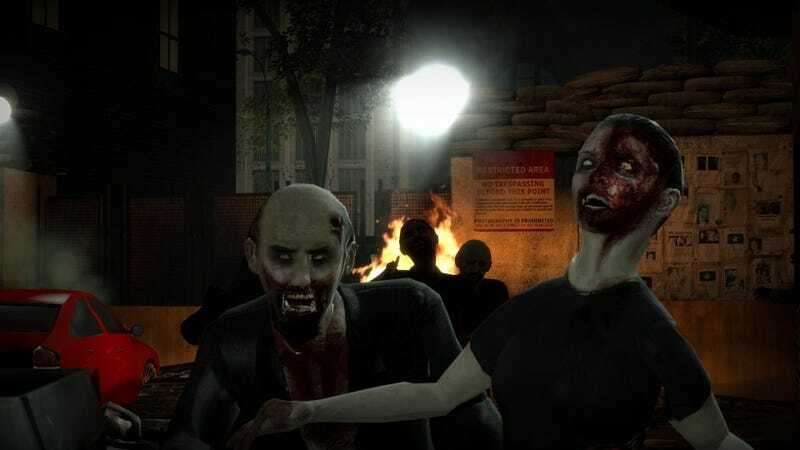 No More Room In Hell is a co-op first person survival horror game where you fight against zombies. In an effort to make it tense, the developers made design choices like having sparse ammo, and only allowing players to communicate with one another if they are actually close in-game. Another curious design choice: one of the zombie types happens to be child zombies. Not everyone is happy about this. Looking through the threads found in the Steam community hub for the game, you'll find that a number of players are currently arguing over whether or not children zombies should be included. We will not be removing them. They are a core component of our game design, our design philosophy, and our long-term vision for NMRiH. Part of our goal was to create a zombie game not based on killing and action, but on tension and fear and moral and ethical choice. We are attempting to simulate a real-world collapse of society as a result of a lethal epidemic. If you cannot handle it, do not play the game. We are sorry that some people seem to be offended for one reason or another but we are NOT going to censor our game and our vision. Reading some posts by players off-put by the zombie children, being unable to shoot them on first encounter.. that is something that we set out to achieve. That reaction is actually intentional, that is what we wanted. This is a game about survival. Our game is free, and we developed it solely out of passion and fun to make the zombie game we always wanted. If you do not like it, we are sorry and it's unfortunate but this is a no-compromise situation. We appreciate any and all feedback on the game, as always. This has done little to stop the debates, of course. We reached out to the developers to ask further about this decision and will update if we hear back. No More Room In Hell was originally released in 2011 as a source engine mod after being in development for seven years. It was re-released on Steam in October 2013.